The 2011 Caucasus Barometer asked the Georgian population, “Relative to most of the households around you, would you describe the current economic condition of your household as very good, good, fair, poor or very poor? The results revealed that 24% of Georgians rate their households’ economic condition relative to most households in Georgia as poor or very poor. 68% say it is fair and only 8% rate it as good or very good. Analysis shows that people in these three groups differ from each other, not only in terms of their perceived economic status, but also in a wide range of activities and feelings such as reading printed media, participating in social and cultural activities, and having feelings of happiness and good health. Source: Caucasus Barometer 2011, GeorgiaNote: In this and following charts the original five-point scale is collapsed to a three-point scale by merging “very poor” (1) and “poor” (2) as poor=1, and “very good” (5) and “good”(4) as good=3. The original score of 3 has been changed to 2 for fair. As the chart shows, people who consider themselves poor compared to most households in Georgia are less likely to read newspapers, spend time with friends, go for a walk, visit the theatre/cinema, do sports or exercise, or go to a public meeting than those who consider their economic status as fair or good. These data indicate that people who perceive their economic condition as good compared to most households in Georgia are forerunners in adopting a healthy life style and much more involved in social and cultural activities. Moreover, the data show that there are some differences between these three groups in their health status, or to be more precise, in how they rate their health. 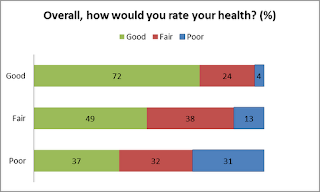 The next chart shows that approximately one third (31%) of those who perceive themselves as poor compared to most households in Georgia rate their health as poor. This share decreases to 13% in the group of people who consider their economic status to be fair and to 4% for those who perceive their economic situation as good. Perceived poverty, less involvement in recreational activities and poor health status may be reflected in feelings of happiness. 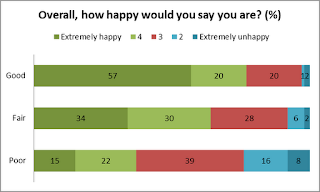 Indeed, data from the Caucasus Barometer indicate that people who perceive themselves as poor compared to most households in Georgia are more likely to say they feel unhappy. The chart shows that approximately one quarter (24%) of people who perceive themselves as poor are unhappy, while this share decreases to 3% in those who consider themselves to be in a better economic situation compared to most households in Georgia. To conclude, the 2011 Caucasus Barometer data show that people in Georgia who consider themselves to be poor compared to most households in Georgia are less likely to spend time with friends, participate in different social and cultural events, or follow a healthy lifestyle (sports, exercise, hiking, etc.) than those who describe their economic condition as fair or good. These people are also less likely to consider themselves happy and rate their health as poor. The 2011 Caucasus Barometer offers more interesting data which is available and free on CRRC’s Online Data Analysis tool. Try it out!